Dr Christina Kelly, the MOSES researcher from Queen’s University Belfast presented work from the MOSES project at the 9th Annual Marine Economics and Policy Research Symposium in Galway, Ireland on the 8th of November, 2018. 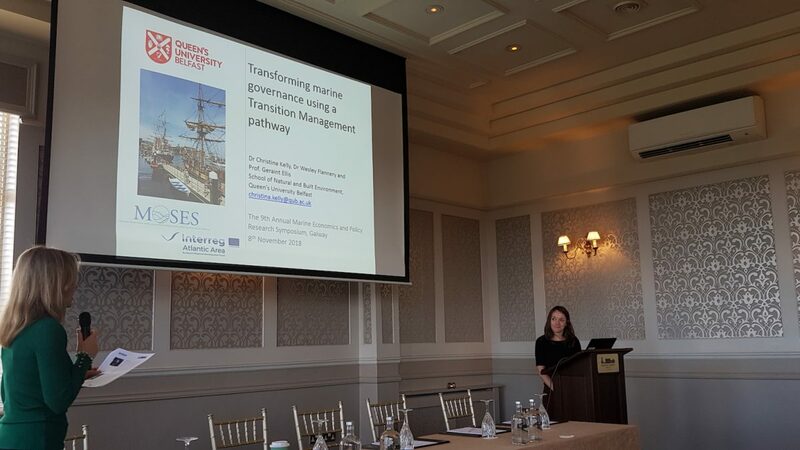 The title of her talk was “Transforming marine governance using a Transition Management pathway”. The presentation discussed the fact that sustainable management of marine resources is a pressing issue for coastal states. Due to the impact of human activities such as agriculture, coastal development and fishing, these resources are being degraded. “Current management approaches which consider each activity in isolation are unsustainable. There is a need for coastal states to transform their sectoral and fragmented governance regimes to implement a more integrated management approach. However, to be successful, integrated governance mechanisms, such as marine spatial planning and ecosystem-based management, must involve the transformative change of institutions, values and practices. This is necessary to overcome barriers such as policy inertia, vested interests, bounded rationality and power imbalances which represent deep-rooted problems associated with a system-wide failure in environmental governance and institutional dynamics” Christiana said. Following a review of the most cited academic papers in the field of marine governance, the findings from the work show that most overlook many of the key institutional challenges to integration, often derived from issues such as incumbency, path dependency and policy layering. Failure to understand and address these persistent problems will continue to hamper attempts to radically change governance regimes, resulting in system lock-in and sub-optimal management. Christiana emphasised the fact that there was a need to develop a more realistic understanding of the context in which transformative change takes place. She argued that Transition Management (TM) has the potential to both conceptualise and operationalise strategies to address these barriers based on a long term perspective of participation, visioning and experimentation. A TM framework specific for marine sectors will be explored in the Belfast Port case study as part of the MOSES project.